SHARING THE EARTH’S BOUNTY: Drought relief co-ordinator Phillip Bowman (centre) was commended by Brett Gilbertson (left) and Millicent Lions Club’s Des Noll OAM for enlisting support from farmers across Millicent and district. 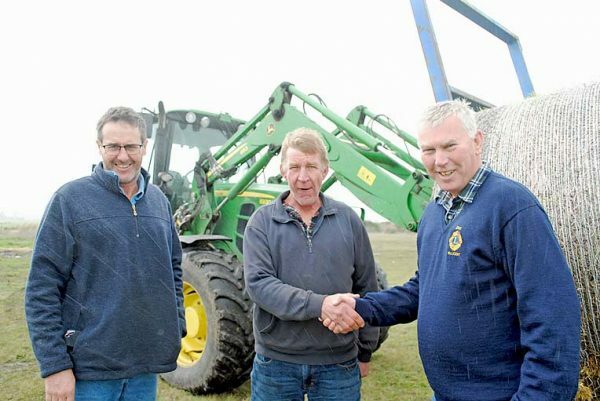 FARMERS across Millicent and district have opened their hearts to the plight of their drought-afflicted counterparts on the eastern seaboard. They have already donated 180 bales of hay after an informal appeal was launched last week by Millicent farmer Phillip Bowman.